​As part of our vision to bring social innovation where most needed, the people of Sen Sok and Community First work hand-in-hand to define the most pressing issues their villages are facing. Once a social issue has been properly identified, our team of volunteer engineers, scientists, and business leaders come together to create sustainable solutions that the people of Community First then adapt locally. This approach helps us create the most resilient programs while also ensuring that all initiatives are tied to a local value chain, without making communities dependent on our organization's work. In the beginning, there was no water. Villagers had to rely on water holes, far away from their homes in the rice fields. Water would collect there for them to harvest and use, but so would pesticides and other agricultural run-off. A borehole on its own is only part of the solution, as the community needs to ensure its long term use for everyone. 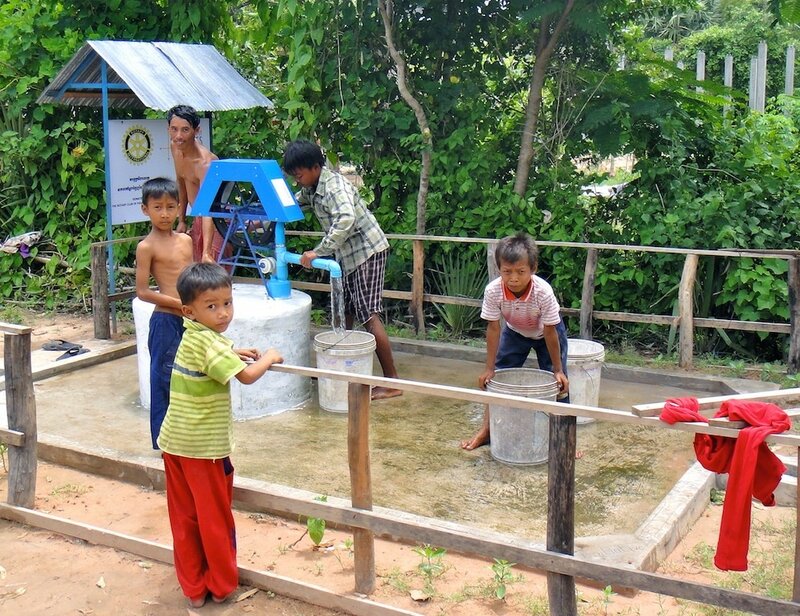 With an very deep water table, the people of Sen Sok are unable to self-finance a deep-water well, on their own. ​By creating a water well committee with the help and training from our field team, villagers can come together and take ownership of the well, and community leaders are able to raise the funds from their neighbors to ensure the sustainability of the well. To date, we've been able to provide clean water to over 10,000 people for a cost per life saved & improved of $2.50 (USD). Today, we're helping communities preserve their water table by training them at water-efficient farming techniques and building water collection systems (learn more). With monsoons watering their fields for a few months a year only, the farmers of rural Cambodia are left to survive with no water for over half the year. As a result, many families are broken up, as most abled adults leave their homes and loved ones to seek wage-paying work in order to help their family survive the dry season. As a result, mothers with children, the elderly and the youth of rural Cambodia are left on their own to provide and care for their homestead. As a result, food security becomes a critical issue, as between the lack of water and the shortage of labor in the villages makes it near-impossible to grow enough food for a whole family. Over 80% of the population of Cambodia lives in rural areas. And in the most remote communities, most people survive as subsistence farmers meaning they primarily farm to feed themselves. The only other activity that brings economic development to their community is the excess rice they manage to harvest and sell. As a result, farmers manage to make only a few hundreds of dollars (USD) a year, making cash extremely scarce throughout the community. In addition, their lack of income makes most villagers almost "un-bankable", unless they surrender their only productive asset as collateral to financial institutions: their rice field. This hard choice affects countless families and puts them at high economic risk. To date, our field team has created dozens of "self help groups" that bring together women and community leaders as an informal financial support group. By pooling together their savings, an alternative lending source is created. Today, we are developing a new iteration of this 'village banking' approach to bring together aquaponic farmers to ensure the financial sustainability of their economic operation. Four years of Khmer Rouge rule combined with the decades of civil war that ensued have made access to knowledge, specifically marketable skills very difficult for entire generations of Cambodians. Especially in rural areas, training programs and continuing education is are rarely found. 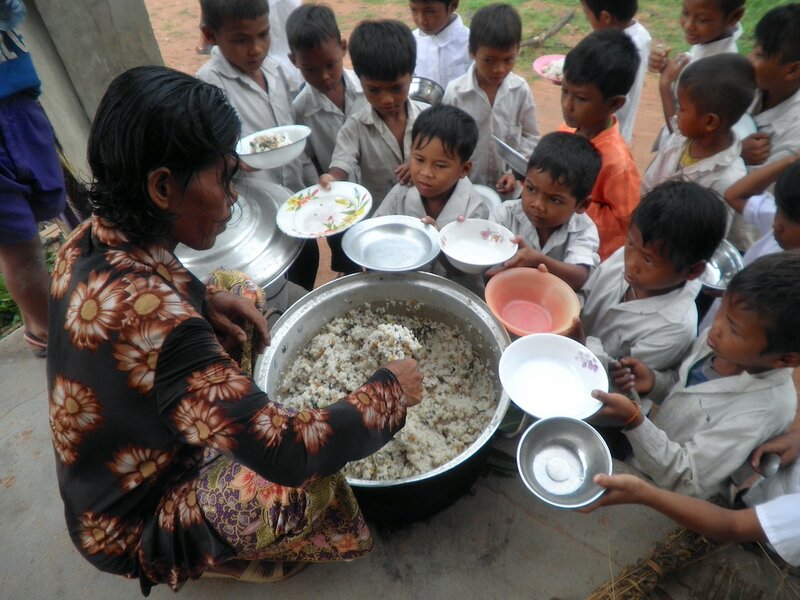 In an effort to change this, in 2009 we built a training center in the middle of the villages of Sen Sok community. What's today known as the Community First Sen Sok Campus has provide a variety of training programs to villagers, most notably sewing and sustainable agriculture. 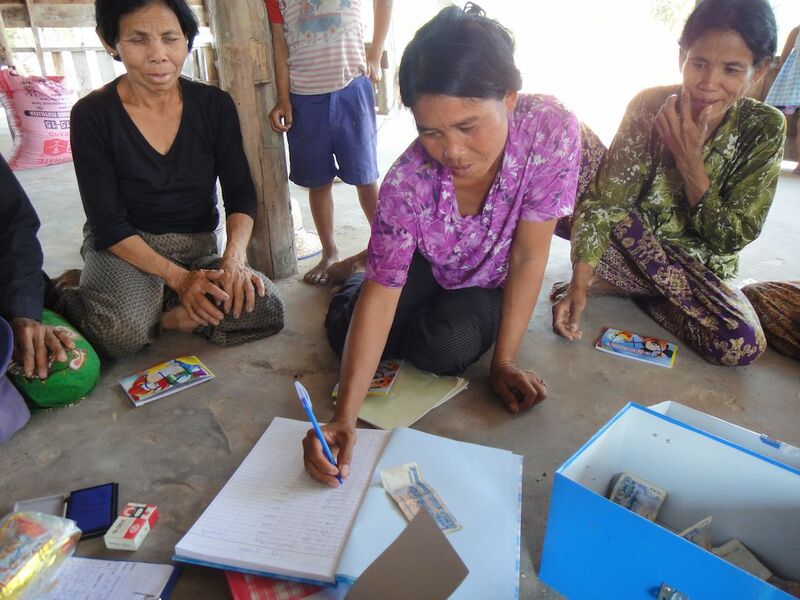 To date, dozens of villagers have participated in training programs at the Sen Sok Campus. And today, all students have graduated from our sewing program, and are now applying their newly acquired skills from their home where they can also tend to their homestead as well. The Campus is now being equipped to serve as our primary aquaponic farming training facility where we will train our first class of villagers in November 2017 (learn more). Drawing from our experience of the past 10 years in helping bring sustainable access to water, better farming techniques, and economic development to the villages of rural Cambodia, we are now bringing off-grid aquaponic solutions to help local farmers free themselves from subsistence and lift their families out of poverty. Over the past two years, our network of volunteer engineers, botanists and scientists have worked diligently towards bringing together two traditional Cambodian agricultural activities - fish farming & fresh produces - with technology. 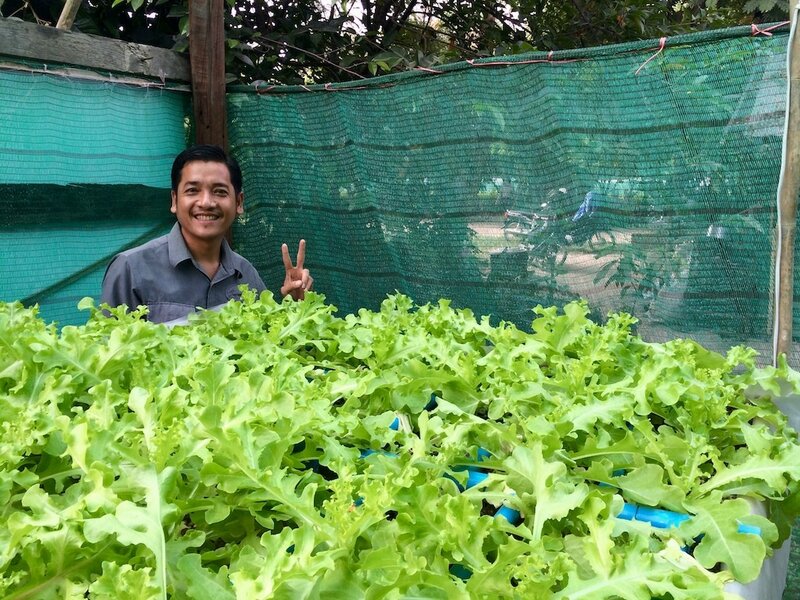 Known as aquaponics, this approach has been long used in the traditional rice paddies of Cambodia, before the use of fertilizer and pesticides made rice-fish culture obsolete in the minds of many. Today, the very first families of Sen Sok community are receiving our latest design for off-grid aquaponics. Don't forget to connect with us by subscribing to our newsletter to keep up with this exciting new developments from the heart of rural Cambodia! By bringing together fish raising and fresh produce farming, aquaponics brings significantly more income to the families that need it the most. But in addition to this economic empowerment, and perhaps more importantly so, this system brings significantly better nutrition at the family level, and can therefore help mothers throughout rural Cambodia prevent their children's lives to be impacted by poor nutrition. Not only can this help the 80% of Cambodians who have to survive off of their farming activities, it can also help bring the number of children stunted in Cambodia down from its current rate of 40%. 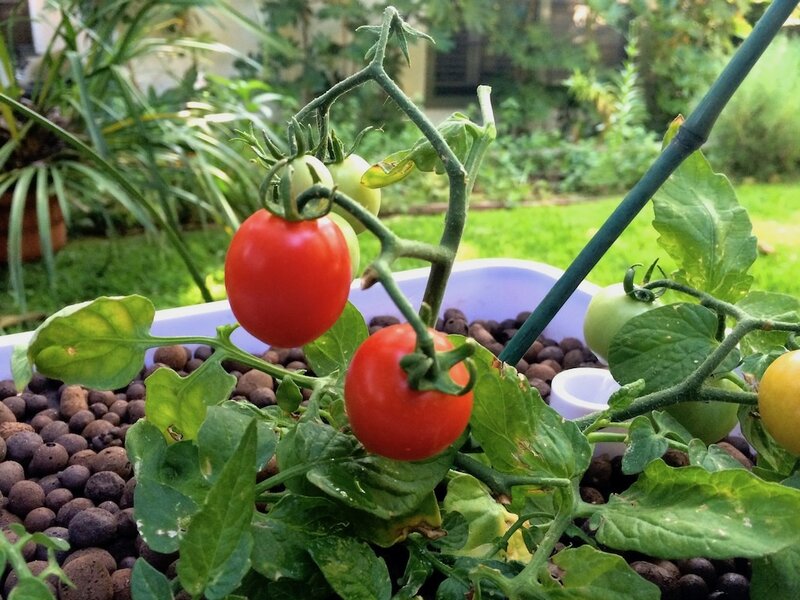 In essence, this makes aquaponics an impact driven solution that has the potential of improving the lives of millions of people and saving that of hundreds of thousands of children, for generations to come, while empowering women and community leaders (learn more).